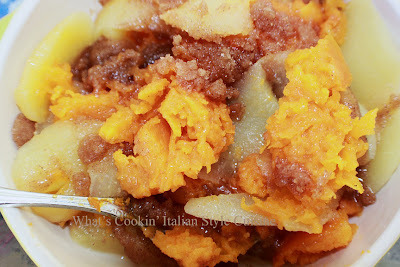 I just love butternut squash so far I have made it three times in one month! This one was a huge eat with my apple fans in the house. 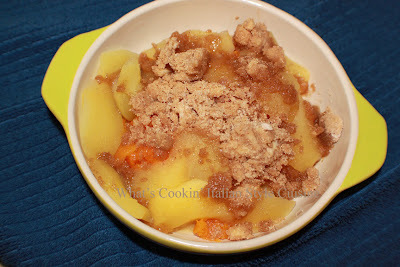 Apples and the sweet squash with all that cinnamon and sugar was a great combination! Grease a 2 quart baking dish. Heat oven at 350 degrees. Too the apples and squash together add to the butter dish. Combine the butter, sugar, flour, salt and spices and mix till crumbly. Sprinkle over the tops of the mixture. Cover tightly with foil and bake until fork tender. This sounds yummy! Can I have some, in fact I think I will take seconds. We love Butternut squash, but have never combined apples with them. We will be making this one soon.